Some of you may have read my previous post (FOUND HERE) regarding Christian statues that weep fragrant oil. I will post more pictures of these miracles later. Here, however, is a similar phenomenon: Christian statues that weep or exude a blood-like liquid. A quick survey of YouTube video searches will demonstrate that these unexplainable events, including apparent blood or tears, are not as uncommon as one might think. (For example, check out the videos of Rosa Mystica, Akita Japan and others.) In fact, many times the liquids being released from the statues have been tested and determined to be from human tears or blood. This is the story of a lesser-known statue of the Virgin Mary that has exuded what appears to be blood. In an earlier post, I briefly described Ruth Werkowski and the ministry that she and her husband, Fabian, have conducted for over 30 years. Each year, they would leave their Florida home and head north for the summer. Along the way, they would schedule Christian healing services at churches and homes. 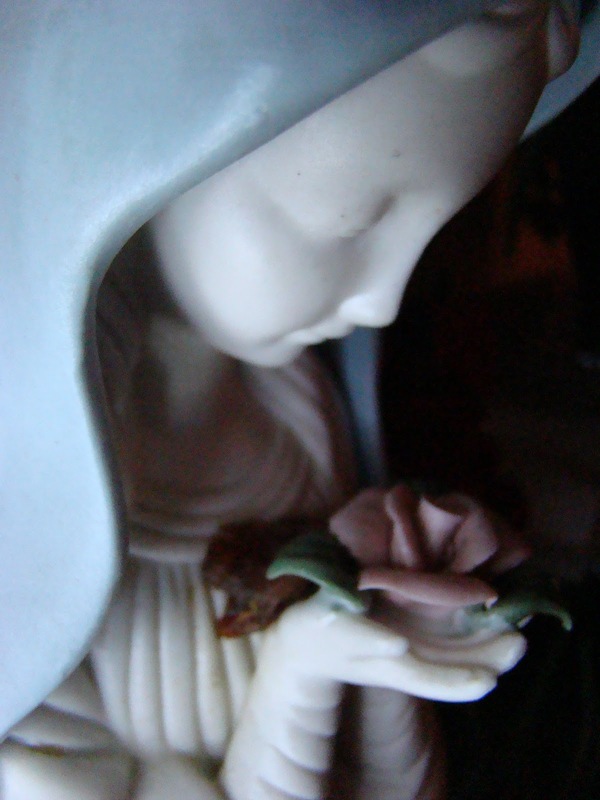 One year, while packing to closing down the house for the summer, Ruth noticed that a statue of the Blessed Mother seemed to be damp with oil. 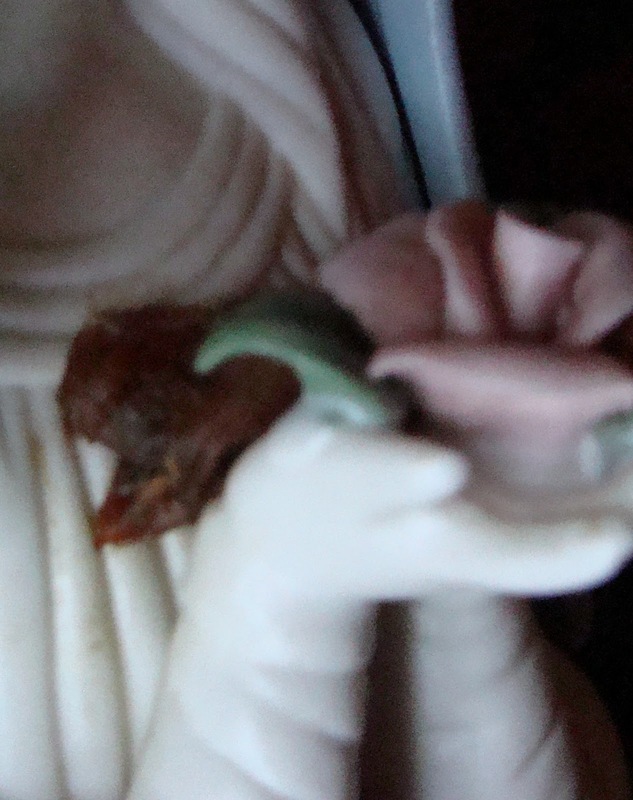 The small ceramic statue had been close to Ruth's heart, especially since it had been a gift from her mother in 1942. Having encountered many weeping Christian statues and pictures during her ministry, Ruth decided to protect the statue from dust with a couple of plastic bags. She also cradled a large cotton ball over the Virgin's wrists (behind a little ceramic flower in the Virgin's hands) to soak up any holy oil that might be wept in the coming months. Then Ruth and Fabian loaded the car and headed north for the summer. When they returned, Ruth was surprised to see that the plastic bags were soaked, on the inside, with fragrant oil. But she was positively amazed when she removed the bags. The cotton ball was soaked with a blood-red liquid. We have not found an expert to verify that it is blood, yet, because Ruth is concerned about damaging or destroying this apparent miracle. She also sees this Blessing as a Gift that she is responsible for and, therefore, she feels obligated to keep it in her custody. After three years, the cotton ball still appears to be moist but does not resemble cotton, anymore. In fact, with all due respect, it looks like a cut of fresh meat. (Perhaps that of a heart muscle?) It is enclosed in a glass case for protection. A lengthier description of this Miracle and others, can be found in Ruth Werkowski's new book, "Transformed by Trouble: From Misfortune to Miracles." The book is available on online book selling sites. Also, more information can be found at www.VeroHousePublishing.com. For more pictures of the Virgin Mary's Bleeding Heart, go HERE.